Former North Charleston police officer Michael Slager testifies during his murder trial at the Charleston County court November 29, 2016. Image via Getty. 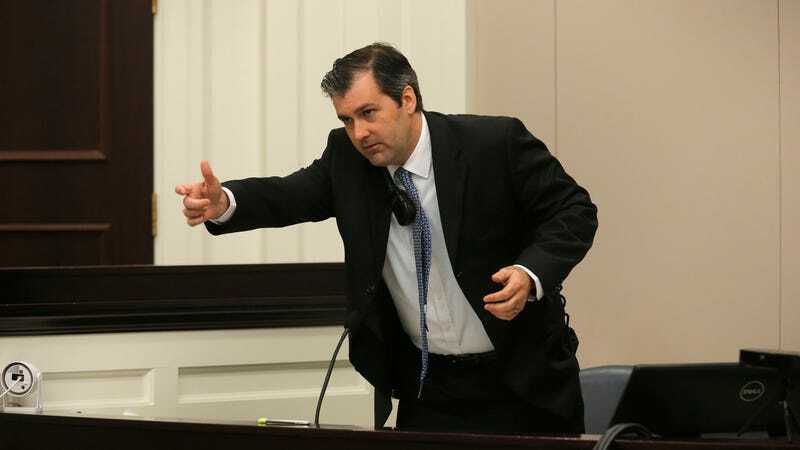 The trial of ex-cop Michael Slager who gunned down an unarmed Walter Scott as he fled has been declared a mistrial after the jury was unable to reach a unanimous decision. The shooting of Walter Scott attracted attention when video footage of the incident surfaced. The video showed then-Officer Slager shooting after a fleeing Scott eight times and then placing a taser near his dead body. Even the #bluelivesmatter crew and many who deny the existence of disproportionate police brutality against black people found themselves unable to justify Slager’s actions. Deliberations began Thursday, December 1 and on Friday we learned that a single juror stood between Scott and a guilty verdict. Of the 12 jurors, just one was black despite the fact that Charleston county, where the trial is taking place, is 28 percent black. The Huffington Post reported that the lone holdout juror was white. The jurors also asked the judge several questions, including why Slager was charged with voluntary manslaughter in addition to murder. Slager could spend the rest of his life in prison if convicted of murder. A voluntary manslaughter conviction could bring a sentence of anywhere from two years to 30 years. The jury also asked if the self-defense standard is the same for a police officer as it is for other people. To recap, in 2016 America, a police officer who swore to protect and serve can execute an unarmed, fleeing black man on camera and still receive the benefit of the doubt. Though we already knew that, didn’t we?